"This guy has it all and can reach out and touch every soul, regardless of age or religious practice. He’s a breath of fresh air and a talented artist." 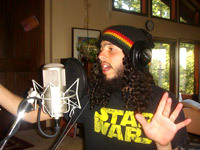 Ari Lesser is a singer, songwriter, rapper, and spoken word artist from Cleveland, Ohio. He graduated with a Bachelor’s Degree in Political Science, and, more recently, spent time in Israel studying Torah in Tzfat and Jerusalem. He has performed all over the world, and written hundreds of songs on a wide range of subjects. Ari’s repertoire is expansive, touching on everything from family, to animals, to politics, but now his focus and passion is making music based on the Torah. He will step into character and rap from the perspective of various personalities in the Bible, and he has also created rhymed translations of about one third of the book of Psalms, bringing their powerful message back into the realm of song. Ari’s performance brings the Torah to life in a way that is inspirational, accurate, educational, and very entertaining for English speaking audiences of all ages and backgrounds. 1 to 2 hour set of original spoken word entertainment. Subjects range from personal, to political to spiritual. Crowd names any animal they want, and Ari does a scientifically accurate rap from that animal’s perspective. Fun for the whole family! Stories of the Torah brought to life with songs from various biblical personalities, and rhymed translations of Psalms. Pick your favorite local musicians, and Ari will come and perform with them live. Ari explains what led him to become a rapper, activist, and Baal Teshuva. Interspersed with original songs and raps. Followed by Q and A. Spoken word presentation to inspire students, followed by a workshop where Ari gives them advice and techniques, to help express themselves through poetry and hip hop. Hip hop Kabbalat Shabbat service. Rhymed translation of Eishes Chayil. Hip Hop Psukei D’zimra. Original spoken word entertainment during and after meals. You choose the subject or content and Ari transforms it into rhyming song lyrics which you can use as you see fit.